Go on a musical adventure with Poppy the dog and friends in Poppy and Vivaldi. Children and parents will love pressing buttons and hearing the instruments and sounds of Vivaldi on every page! Go on a musical adventure with the adorable dog, Poppy, and learn about Vivaldi as he listens to favourite sounds from the great composer with his friend Enzo. The two friends take an unforgettable trip to the Carnival of Venice, where they hear the sounds of the mandolin, cello, flute, and more. From The Four Seasons to Griselda, Poppy and Enzo explore the opera and take a ride on a gondola, listening to the sounds of Vivaldi and learning a little bit about this great composer at the same time. 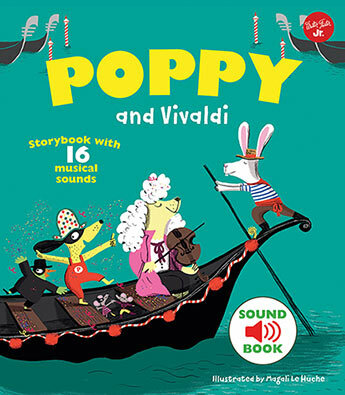 With 16 buttons to push and hear, kids will love listening to the sounds of Vivaldi and the different instruments as they follow along with the story. With colourful illustrations and a new sound to discover on each page, both kids and parents will be entertained and engaged for hours. Poppy and Vivaldi offers an opportunity to teach kids about classical music and the sounds of some of Vivaldi’s great works. Now that is truly unique!